I am also a CANADIAN MUSICIAN (born Chilean) settled in Montreal, Canada, who is available for private o public concerts. Is it your father's or mother's birthday? Do you have an event in your enterprise? For only CAN$ 350, you can have a GREAT CONCERT with ROMANTIC BOLEROS, SPANISH SONGS & BOSSA NOVAS, in two parts (45 minutes each with a 15 minutes break). 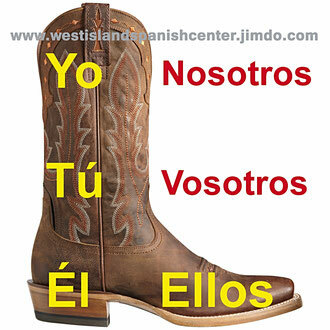 With Los Verbos Bota, you will master the most common kind of irregular Spanish verbs in a fun way!! 1. The playback of the song LOS VERBOS BOTA in mp3 format (320 Kbps). 2. The background & lyrics of the song for singing wherever you want. 3. A book (pdf or epub format) with a clear explanation. The book includes around 100 VERBOS BOTA conjugated in the present tense, being classified by kind of irregularity (4 + 1 not described on the video=5) and by kind of conjugation (ending with AR, ER or IR). 4. A video with no graphic background for practicing lyrics. Curso de Inglés (o de francés) desde el español: incluye una "sesión 0" de 30 minutos, para evaluar previamente al/a la estudiante. Après le début du cours le montant payé ne sera pas remboursable. La "sesion 0" fait partie intégrale du cours. Once the course has begun, the amount paid is not refundable. Note: "Sesión 0" is considered the first part of the cours.